So Fast and Fun, You'll Want to Read Them ALL! Tales From the Terrible Scary stories aren't terrible, and they aren't really scary, but they are TONS of fun, and you WILL want to read them over (and over) again, while waiting for the next ones to come out. Tales From the Terrible Scary are stuffed with fun characters, memorable adventures, and stories that are so much fun to read, you're time will feel like a ghost. Callum Parker just wants to enjoy finally having the house (mostly) to himself after his parents go on vacation. But after his grandma falls ill, and his friend Danny decides to sell his sister on eBay, Callum's life might be ruined forever. Lofty and Zach have been unlikely friends ever since they both got a job swabbing decks for the infamous pirate, Captain Curry. Now Captain Curry has gone after the biggest haul of pirate booty in history, hidden deep inside The 10 Tunnels of Terror. If Lofty and Zach can outsmart the puzzles inside the tunnels, and outlive the not-so-merry-band of scurvy pirates, they'll have treasure beyond their wildest dreams. If not, they'll spend their eternity in Davy Jones' locker. Nick's father, Professor Louis Bean might just be the world's greater inventory. If he can ever manage to get things right. He might just be the next Thomas Edison, but after a series of failed inventions, from the Insect-Inside to the Fossilizer, to the Connect-a-Frame and Pickle Pickler, the professor might not be capable of making anything that works at all. Nick desperately wants to see his father succeed, and after his invention of The Cravinator — a food supplement that allows people to eat whatever they want without ever gaining a pound — it looks like he finally has. But after The Cravinator goes bad and Professor Bean invents one disaster after another hoping to fix the problem, he accidentally puts the world in jeopardy. 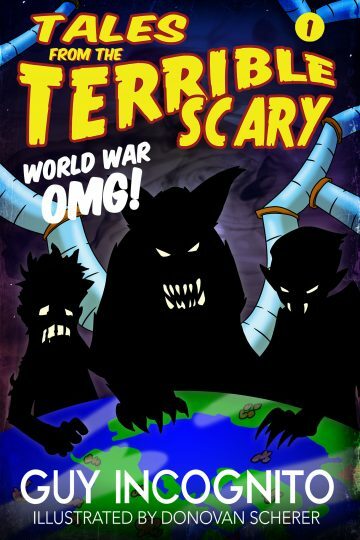 With vampires, werewolves, and zombies, World War OMG! might be the worst thing that's ever happened to humanity … or the last. Get Tales From the Terrible Scary Volume 1 and Start Reading Your New Favorite Series Right Now!